TNA Sacrifice is this weekend and it should be a good one. Here's who I'm picking to win in each match. After the PPV is over, I'm expecting the feud between Foley and Jarrett to intensify and to lead to a singles match for the TNA title between the two at Slammiversary. The question about whether Bobby Lashley will join the Main Event Mafia should also have some more answers. On paper, this is a good card and I expect it to be a decent show. Judgment Day is here once again with some exciting matches but unfortunately, nothing of significance is going to happen. There are four title matches, but if all goes according to plan, all four champs should retain. Randy Orton defends his WWE title against Batista. Batista has lot so many title matches over the years that every time he challenges for one, it's so obvious that he won't win. Orton will retain. Over on Smackdown, Edge defends the World title against Jeff Hardy. These two have had some spectacular matches agaonst each other, but Edge should win to set up a potential feud with the Undertaker. Christian defends the ECW title against Jack Swagger and Rey Mysterio defends the IC title against Chris Jericho. Expect both champs to retain. This was my first BSE Pro show and it was a lot of fun. The Ontario indie guys are all hard workers and it showed as they all worked really hard. Kryme Tyme's return to the ring after a five-year hiatus was a lot of fun to watch. He teamed with TNA's Matt Morgan to take on Jason Sensation's Reflections of Perfections (Flesh and Vlad the Penetrator). Flesh hurt his knee at the end of the match and will be out a few weeks so I hope he's okay. The biggest surprise of the show was seeing Sinn Bodhi (formerly known as Kizarny in WWE) make an unannounced appearance. I got to talk to him at the merchandise table and he's a cool guy. My favourite match of the evening was a mixed tag team match pitting Robert Roode and Traci Brooks against Robbie McAllister and Taylor Wilde. All four worked hard to put on a good match. I had the chance to talk to Kryme Tyme after the event and he told me he's going to try to bring BSE to Port Perry for another show before the end of the summer. If you're a wrestling fan and live in the Greater Toronto area, it's well worth the drive to see some of the best wrestlers perform, so come on out when you hear about BSE coming to your area. Hi everyone. Sorry that it's been a while since I last wrote a post. I've been busy with my work placement. Anyways, I'm back so let's get back to wrestling talk. I want to use this post to talk about a charity wrestling event coming to Port Perry, Ontario. For those wrestling fans living in Ontario and the surrounding provinces and states, you may be familiar with Blood Sweat and Ears (BSE) Pro Wrestling. BSE has been one of the more successful Ontario indie promotions as it features many up and coming wrestlers as well as established veterans. Various well-known names who have grappled for BSE in the past include Lance Storm, Abyss and Christopher Daniels. BSE will be at the Scugog Arena in Port Perry this Sunday (May 10) at 3 p.m. for a charity show entitled 'A Night of Kryme'. This show will mark the in-ring return of former WCW and OVW developmental talent (and Port Perry resident) Kryme Tyme. For those who remember Kryme Tyme, he wrestled as a developmental wrestler for WCW several years back. The highlight of his career was wrestling in Nitro and Thunder matches against Scott Hall and Billy Kidman. Kryme Tyme also wrestled a lot on the Ontario indie scene. Kryme Tyme teamed up with BSE to bring this event to Port Perry to raise donations for several local charities to honour his father, who was a big supporter of his wrestling career and died two years ago because of cancer. Aside from Kryme Tyme, several BSE regulars, such as Kobra Kai and Tyson Dux will be appearing. Also, many TNA stars, including Robert Roode, Taylor Wilde and Matt Morgan, will be on the card too. I had the chance to interview Kryme Tyme about this event. You can see them here and here. For info on the event, go here. I'll be at the show covering it for the local paper and I'll have a recap post on it next week. Well, I said in my preview post that Backlash was going to be bad because of a lack of build but I was proven wrong with a fair amount of quality matches. Cena and Edge stole the show with a great last man standing match. Cena's FU into the crowd was one of the coolest spots I've seen in a while. Edge winning came as no surprise as Smackdown needs a world champion. Big Show's interference will mean he will feud with Cena somewhere down the line, which I'm not really looking forward to. It's hard to tell who Edge will feud with next, maybe Mysterio, Jeff Hardy or Punk. The six-man match was okay. I'm glad Orton won and with the move that has made him most effective as a heel, the punt to the head. It was hilarious when the crowd was singing the goodbye song to Trips as he was being carted off. Christian won the ECW title over Jack Swagger in another good match. It's difficult to tell who Christian will feud with next. If WWE is still playing up the Tommy Dreamer retirement angle, I expect the ECW original to get a shot soon. The Beth/Santina/Khali segment was so brutal and has no place on tv let alone a ppv. The Hardy vs. Hardy I Quit match was good and this match may have been the blow off to the feud. I think Punk needed to win in his match against Kane to make him strong as the MITB winner but that didn't happen. Jericho and Steamboat was a good match as Steamboat still has it. I wonder which legend Jericho will feud with next if they continue this angle. Overall, Backlash surprised me but TNA Lockdown still wins as the best wrestling ppv in April. Traditionally, Backlash has always struggled coming off the heels of Wrestlemania because the build for the PPV has always been short, usually just three weeks. This year is no different as again WWE hasn't had enough time to build for the PPV. The lack of build shows as Backlash appears to be a PPV that will struggle to attract buys. Despite that, I still feel inclined to give my predictions for Backlash. WWE's poor ability to build for its PPVs, Wrestlemania 25 included, will have to wait for another time. The main event is a six-man tag between Legacy and the McMahon family. If anyone from Legacy gains the fall, Randy Orton wins the WWE Championship. If anyone from Triple H's team wins, Triple H retains the title. Since Orton has been so buried in this feud and we all know how much of an egomaniac Trips is, I expect Triple H to retain. Next up is a last man standing match between Edge and John Cena for the World Heavyweight Championship. 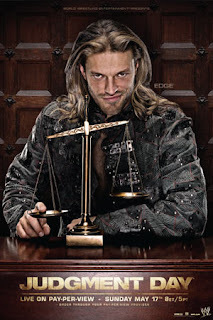 Since both heavyweight titles are on Raw, I predict Edge will win and take the title to Smackdown. This should be a good match and may be match of the night. The Hardys continue their heated rivalry in an I Quit match. Matt has won every match so far in this feud so I expect Jeff to win to even the score. This also has match of the night capabilities. Lockdown has come and gone and a lot of interesting things occured. Mick Foley winning the TNA title was a big surprise to me, but it makes sense in the grander scheme of things. When Jeff Jarrett eventually turns heel and joins the Main Event Mafia, he will probably feud with Foley over the title and control of TNA. The debut of former WWE wrestler Bobby Lashley was also a surprise to me. TNA was promoting that a former world champion from WWE would debut at Lockdown. Many speculated that it would be Tazz, but it was a total shock when it was revealed as Lashley. Lashley's interference in the Lethal Lockdown match and his supposed alliance with the mafia should help to boost the feud between the mafia and the front line. The shocks keep on coming as I was surprised that Team 3D won the title for title tag team match against Beer Money as I think Robert Roode and James Storm would benefit more from a win than 3D. I expect Beer Money to regain the titles very soon for the reasons I just explained. Other winners from Lockdown include Angelina Love winning the Knockouts title, Suicide retaining the X Division title and the Motor City Machineguns retaining the IWGP Junior Tag Team titles. Eric Young, ODB and Matt Morgan were also winners. 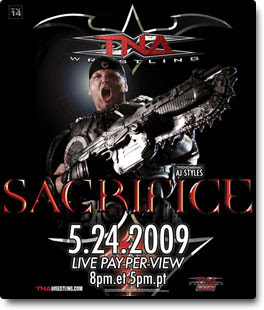 Next up for TNA is their May pay per view, Sacrifice. Hello. My name is Eric Laganis and I'm a journalism student in Oshawa, Ontario. I'll be done my co-op in a few weeks and I hope to find a job in the media business this summer. I love writing and wrestling so I decided to put the two together to create this blog. I hope you enjoy it.